Stenner Pumps 45MP5 fixed rate chemical feeder is built with two detachable components: the motor and pump head. Outputs are dependent upon the rpm of the motor gears and the size of the peristaltic pump tube. 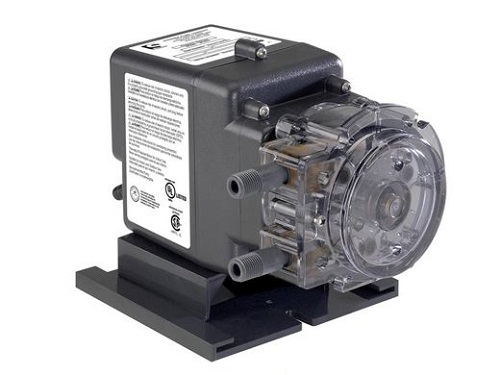 The fixed rate pump has no output adjustment. All Stenner metering pumps have a 3-point roller design in the pump head, which acts as a check valve to prevent back flow, siphoning, overdosing and loss of prime. The motor's output shaft rotates at a fixed rpm which drives the roller assembly within the pump head. The chemical solution in the pump tube is captured between the rollers as they rotate and compress the tube. As the rollers advance, the squeezed tube section regains its original form and generates a vacuum, creating the self-priming feature that delivers a constant flow unaffected by the outlet pressure.